During the period of Oliver Cromwell's Commonwealth, the Book of Common Prayer was outlawed and replaced with a Directory for Publique Worship. However, once Charles II was restored to the throne in 1660, the BCP was restored, and, along with that came calls for its revision. The loudest of these came from Presbyterians, who ideally wanted to return to something much like the Directory, removing all ceremonial and any "objectifying" of worship (e. g., the ring in marriage, the sign of the cross in baptism, etc.). Arrayed against them were the newly-restored bishops, many of whom (such as Dr. Cosin, pictured at right) wished for more ceremonial than was then allowed in the BCP. To settle the matter, a conference was called at Savoy hospital with equal numbers of Presbyterians and bishops to decide the direction for a new Book of Common Prayer. 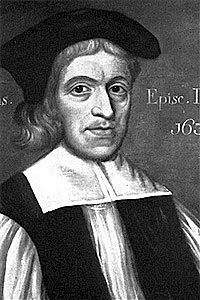 The Presbyterians, led by Richard Baxter, presented their proposals, but the bishops and the mood of the country were not of a mind to accept them. The only substantive Presbyterian proposal agreed to was to use the Authorized ("King James") version of the Bible for the lections. The 1662 BCP did not arise solely from the conference called to draw it up, but had a number of antecedents, mostly from clergy left to their own devices during the period of the Commonwealth. One of these was Bp. Matthew Wren, who used his enforced leisure time while imprisoned in the Tower of London for this very purpose. Much of the changes in the 1662 BCP, however, are due to John Cosin, formerly Dean of Peterborough, and later Bishop of Durham. Cosin was a ritualist in the tradition of William Laud. Because of this, he was forced to flee to France during the Commonwealth, where he developed his own thoughts on the direction of the BCP, which he generally felt ought to be closer to the 1549 book. 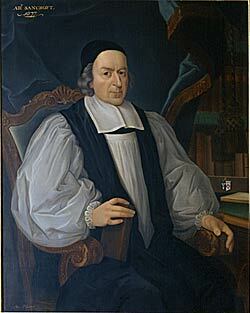 After the Restoration in 1660 and his return, he, with the assistance of William Sancroft (later Archbishop of Canterbury), put his proposals, based on his studies of the past several years, on Bp. 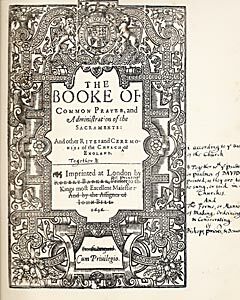 Wren's work, and on the 1637 Scottish Prayer Book, down as marginal notes in a 1619 copy of the BCP, which later became known as the "Durham Book". Sancroft then consolidated these into what is called the "Fair Copy" for presentation to Convocation in 1661. The text of both the Durham Book and the Fair Copy was edited and published in 1961 by GJ Cuming (out of print but should be available used). Cosin, as noted, was a Ritualist, but Convocation was not prepared to go as far in that direction as he would have liked. Therefore, many of his proposals were not adopted. 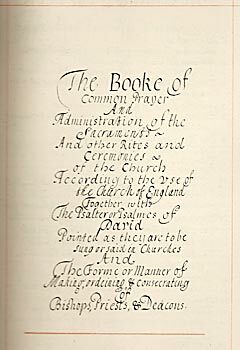 What Convocation did approve was written up concurrently in manuscript form ("The Annexed Book") and in the "Convocation Book", which is a 1636 BCP with corrections and additions. The Annexed Book was attached ("annexed") to the Parliamentary Act of Uniformity which authorized the 1662 Book of Common Prayer. Both texts are given here and are the ultimate source for the 1662 BCP. The Annexed Book was reproduced in facsimile in 1891 (title page at right); this book is online in PDF graphics at Google Books. The text presented here comes from a printed transcription of this manuscript published in 1892 by Eyre & Spottiswoode. A casual perusal of the text will quickly indicate that spelling, capitalization, and punctuation are not consistent and are often quite different that which would be used today. The text used here scrupulously maintains these "features" as detailed in the publisher's preface. Except for a few modernizations, we have attempted to follow the printed text as closely as possible. This book is also available from Google Books and the Internet Archive as PDF graphics. The facsimile Annexed Book is listed in David Griffiths' Bibliography of the Book of Common Prayer as 1891/1, and the printed transcript as 1892/2. The Convocation Book was thought lost for over two centuries, but was discovered in 1867 in the proverbial Government warehouse. It was then published as a folio photographic facsimile in 1870; the book used here is a reprint from a year later and is listed as Griffiths 1871/1. As mentioned above, it is a 1636 BCP with corrections, additions and deletions hand-written in by William Sancroft. Because of the nature of this book, it is presented here as PDF graphics. Also, because this book is quite large (pages 10" x 16") it was necessary to scan each page twice and then combine the scans; artifacts of this process can be seen at times. Additionally due to the large page size the book was split into a number of files, as may be seen in the links below; the total size of all the PDF files is 325MB. 1 An Act for the uniformitie of Common Prayer. 3 Concerning the service of the Church. 5 The Order how the Psalter is appointed to be read. 6 The Order how the rest of the holy scripture is appointed to be read. 7 A Table of proper Lessons, and Psalms. 8 Tables, and Rules for the Feasts, and Fasts through the whole year. 9 The Kalendar, with the Table of Lessons. 10 The Order for Morning Prayer. 11 The Order for Evening Prayer. 12 The Creed of St. Athanasius. 15 The Collects, Epistles, and Gospels, to be used at the ministration of the holy Communion throughout the year. 16 The Order of the Ministration of the holy Communion. 17 The Order of Baptism, both publick, and private. 18 The Order of Baptism for those of riper years. 19 The Catechism, with the Order for Confirmation of children. 21 Visitation of the sick, and Communion of the sick. 24. A Commination or denouncing of Gods Anger and Judgements against Sinners. 26 The Order of Prayers to be used at sea. 27. A form and manner of ordaining Bishops, Priests and Deacons.